Why are antibiotics given to chickens? Is antibiotic-free chicken better? 19 Jan Antibiotics: Should I Be Concerned About Antibiotics Used On Chicken Farms? Antibiotics are just one of many tools farmers use to keep their flocks healthy, in order to contribute to a safe and wholesome food supply. Today, all chicken farms are under a health program designed by a licensed veterinarian. But just like people, animals sometimes get sick, and treating illness is a responsible part of animal care. When this happens, farmers work with animal health experts and veterinarians to determine if an antibiotic is needed. The vast majority of the antibiotics that we use are never used in human medicine, and we’re taking steps to phase out those most critical to human medicine. Chicken producers are committed to innovation, and the work that farmers and veterinarians are doing to ensure the safety and health of their flocks – and thereby our food supply – creates a vast amount of choice for consumers. Whether consumers choose to spend their food dollars on traditional chicken, organic or chicken raised without antibiotics, they can be confident in its wholesomeness and safety. As this trend continues to grow, consumers will have more choice than ever in the chicken they choose to purchase, and through ChickenCheck.In, we hope to provide consumers first-hand access to the information they’re looking for in order to make informed purchasing decisions. I read a report that the use of antibiotics on farms contributing to a rise in antibiotic resistance and that animals raised without the use of antibiotics harbor fewer “superbugs”? Is this true? However, we’re proud to say that chicken producers have been leaders in proactively and voluntarily taking steps toward finding alternative ways to control disease while reducing antibiotic use. We all have a role to play – including doctors and farmers – in preserving the effectiveness of antibiotics, both in humans and animals. Antibiotics are used sparingly in the chicken industry, and The National Chicken Council believes medically important antibiotics should only be used on the farm to treat and prevent disease – not administered to promote growth. In fact, more than 50% of chicken production is now raised without any antibiotics ever. The most important thing to remember is any possible bacteria, antibiotic resistant or not, is not resistant to the heat of your oven or grill and is killed by proper cooking. To learn about proper cooking and handling techniques, visit ChickenRoost.com. What about antibiotics used for growth? Should I be concerned about those? The majority of antibiotics used in raising chickens are not used in human medicine. However, as of December 2016 antibiotics that are used in human medicine will only be permitted to be used to address disease and treat sick animals – not to promote growth – and even then they will be used exclusively under the supervision and prescription of a veterinarian. We believe that medically important antibiotics should only be used on the farm to treat and prevent disease – not administered to promote growth, and are glad to report that many poultry producers are already far ahead of this deadline. Of the antibiotics that are used to treat and prevent disease, a class of antibiotics called ionophores (and another group of medicines called non-antibiotic coccidiostats) is commonly used to treat the most important and potentially devastating diseases we have in poultry – coccidiosis. Not only are both of these medicines not growth promoters and have no FDA-approved use for growth promotion, they are not used in human medicine – ever. So does the chicken I buy have antibiotic residue in it? All chicken you buy is technically “antibiotic free” – federal rules require that if any antibiotics are used on a farm they must have cleared the animals’ systems before they can leave the farm. 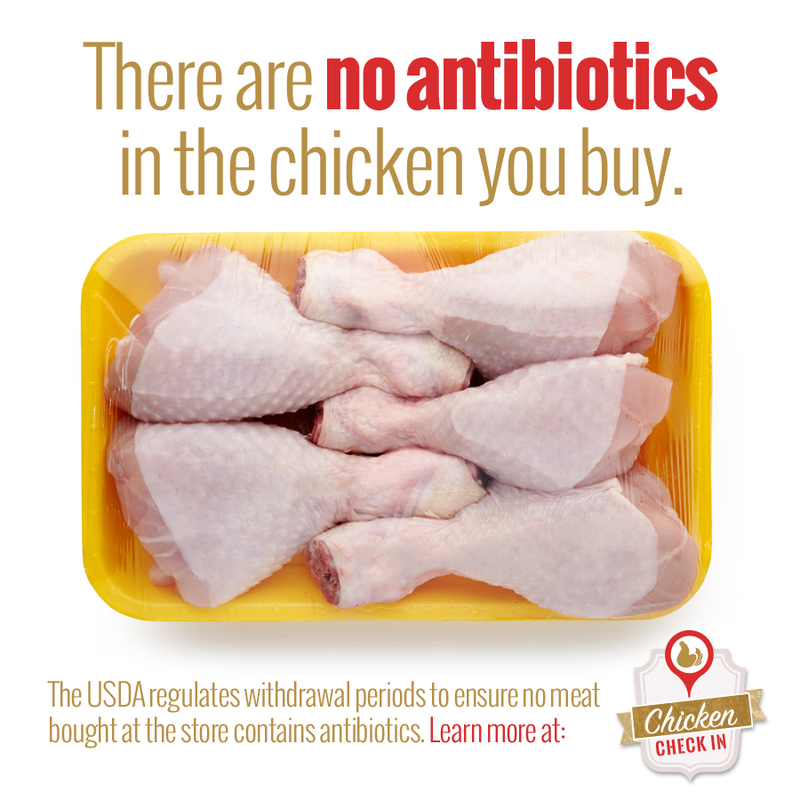 To download a PDF of this FAQ on the use of antibiotics on chicken farms, click here.